I'm thrilled to have this sweater off the needles! I found buttons in my button jar that matched perfectly. Whenever I'm out and about shopping, if I see buttons I like I buy them not knowing their sweater future. Most of the time this works out for me! I created some waist shaping a third away from the side seam, added a little lace detail along the button band edges. The edging of the body and the sleeve cuffs are four garter ridges then an i cord bind off. This gives the edge a polished look. For the button bands, I only did four ridges of garter stitch and bound off regularly. 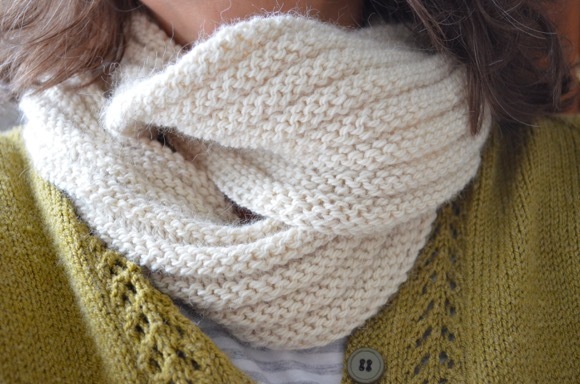 The neck edge was complete using one garter stitch ridge before an i cord bind off. I love it! I want one. And I love your hair cut, I can see a peek of it I am off in a little bit for my salon appointment, I'll let you know how it goes. the buttons couldn't be better!!! love the look on you…..great color, fit. and just in time for spring sweater-weather! Beautiful! Perfect timing too, it's a gorgeous early spring cardi. So beautiful! Adding the lace down the front was a great idea and the buttons are perfect. Well done! Karen, it turned out beautifully! I adore all the details of your cardigan, it is absolutely perfect!! That is so beautiful, Karen!! I love the buttons! What a lovely spring sweater! I love the lace detail. Maybe this post should have that Rod Stewart song "You Wear It Well" as background music! So very pretty! I love cardigans and this one is definitely a favorite now. You did a beautiful job! Oh that is lovely well done for a finish!!! I like how you do your neck line. What a finish. What a talent you are! such a beautiful and original knit!! And it looks amazing on you!! and it looks like the cold weather is still here and will give you a lot of time to wear it!! Love it! The lace detail is perfect. 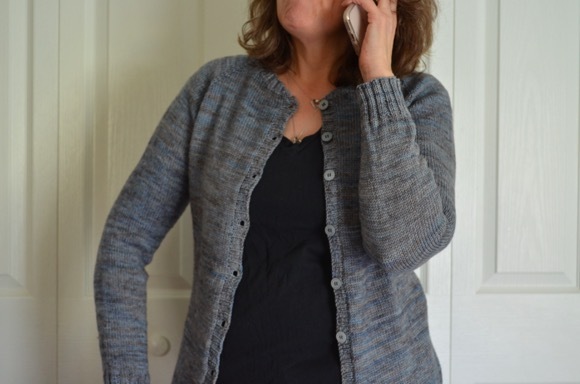 Your cardi turned out beautifully! Wow, it looks awesome on you. Love that colour! What a great fit! It looks fantastic on you. Excellent job. That many buttons makes me nervous. Buttonholes, button attaching .. . it all gives me a case of sweaty palms. Perfection and it looks beautiful on you ! Oh my goodness - it's gorgeous! I love everything about it - the lace, the raglan increases, the colour, the buttons. Dreamy! I am in awe. Stunning! I love it. Nice work! Great job! It's a perfect fit! Another beautiful sweater, Karen! I really love the color. It fits your perfectly, too! This is a beautiful project!!! And such a lucky find with those buttons-- I too buy without often knowing what I'm putting them on. It is absolutely beautiful! I love the lace inserts and the I-cord neck. Love how it turned out! Fits you perfect. This is such a cute sweater! Lovely color, too! So lovely! I am reading this and thinking how easily you've made all these wonderful modifications (which all make the sweater!) Such a gifted knitter! OOh gorgeous...it's a lovely fit. Amazing.